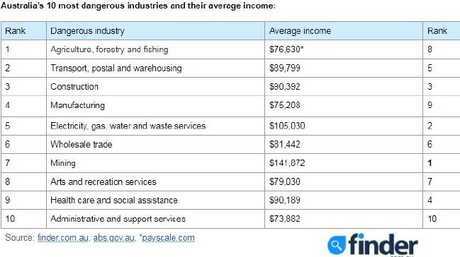 SHOCKING new research has found Australians who put their lives on the line by working in the nation's deadliest jobs are barely getting paid above the average wage. 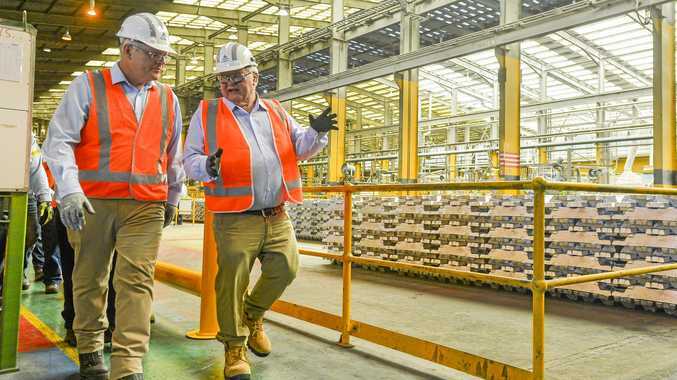 An analysis of Safe Work Australia and ABS data conducted by comparison site finder.com.au has revealed the country's riskiest industry - agriculture, forestry and fishing - pays just $1032 more per year than the average Australian income. Earlier this year, agriculture, forestry and fishing was found to be the most dangerous industry in the country for the third year in a row. 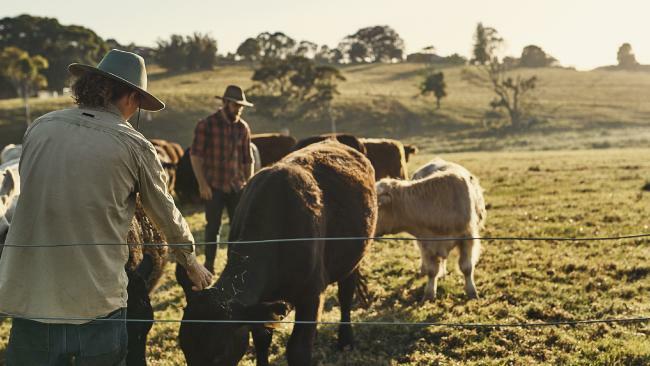 In 2016, the industry recorded 44 deaths on the job, but despite the inherent danger involved, the average agriculture, forestry and fishing worker is paid just $76,630 per annum, compared with the average national earning of $75,598. Manufacturing is the country's fourth most dangerous industry, but workers are typically paid slightly below the national average. The most highly paid of the top 10 most dangerous industries is mining at $141,872 on average, followed by those in electricity, gas, water and waste services who earn an average of $105,030 per year. Finder.com.au's insights manager Graham Cooke said Australia's most dangerous jobs don't necessarily pay the most. He reminded workers in risky jobs to consider income protection in case of a serious accident or injury. "It's always important to protect your income no matter how high it is, and it's those who work in more dangerous industries who should consider income protection as an option," he said. "Workers compensation is an option if something does go wrong, but should be thought of as a last resort and not a definite payout; it's always best to have an extra safety net. "It's important for employees to minimise workplace risks as much as possible, as workers compensation also won't cover incidents that occur as the result of employee negligence." Sadly, 3414 Australian workers have lost their lives on the job since 2003. Australia's second riskiest jobs are in transport, postal and warehousing followed by construction in third place. Jobs in electricity, gas, water and waste services are becoming more deadly after that industry jumped from ninth place in 2015 to fifth in the most recent list. Mining has dropped one place to the seventh most dangerous profession. A massive 69 per cent of all fatalities in the country occurred in the top three most dangerous industries. The ranking, revealed last month, was based on the rate of fatalities per 100,000 and the rate of compensation claims per 1000 workers. Meanwhile, the country's safest jobs are found in the financial and insurance services, with only 620 serious injuries and no fatalities in 2016. Is it time for all Australians to be paid by the government?